Apparently, I’m young at heart. 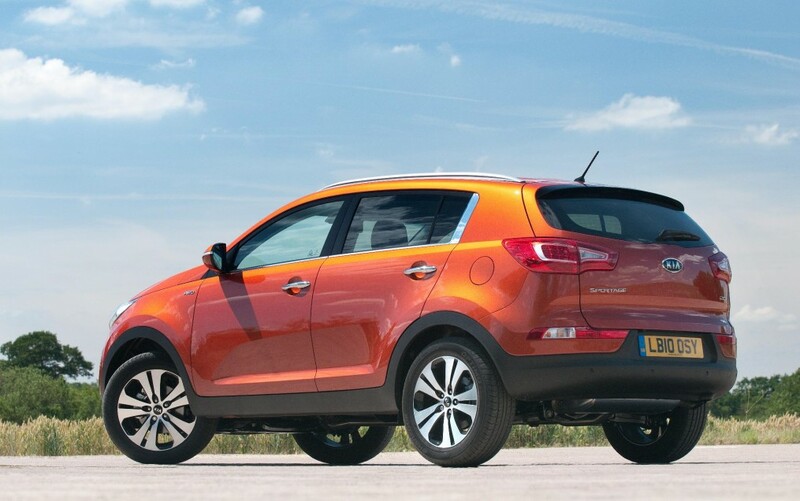 Well, according to Kia who designed the latest Sportage for people like me, who want to drive a compact SUV that looks that little bit different. It has an understated ‘attitude’ which is urban-centric and aerodynamically pleasing to the eye. The Sportage is also the first Kia that I have actually wanted to drive, as well as launching a new design era for the brand. If you can remember the nondescript former model, this one is light years ahead. It looks more sleek, athletic and is topped off at the front with the ‘tiger nose’ grille that is designer Peter Schreyer‘s trademark. The big front grille on the Veloster Turbo suggests this is a happy coupe – it’s certainly a cut above the normally aspirated versions further down the range, which only have 138bhp to play with. The Turbo’s 184bhp gives it a decent turn of speed, although in the US the same engine has been tweaked to 204bhp! What a shame that American model isn’t available here. The Hyundai feels like it could handle a lot more performance. 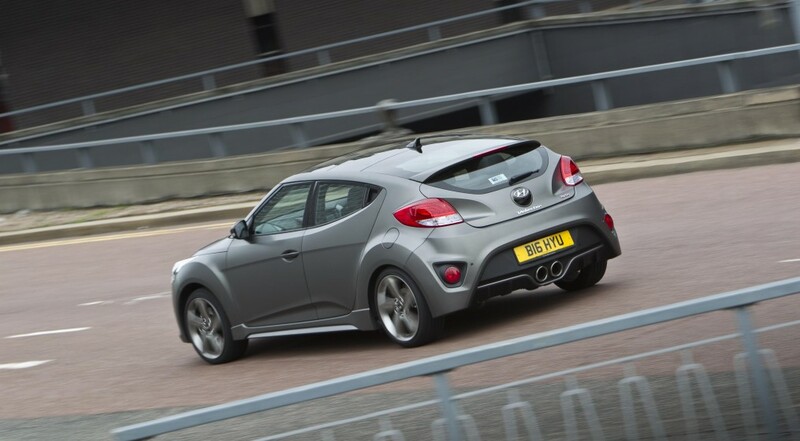 It would help give the Veloster the edge over key rivals like the VW Scirocco and Astra GTC. Our Turbo pulls well from low revs and is pretty smooth too. You have to work the six-speed gearbox on twisty A-roads but it will reward you with decent handling – if only the flat sounding exhaust pipes added a more exciting soundtrack! The best two words to sum up the Forester? Rugged and reliable. Yes, if you want chrome tailpipes and fancy stuff, go buy a Ford Kuga. You’ll regret it in the long run if you hanker for an SUV that actually does what it is meant to do. 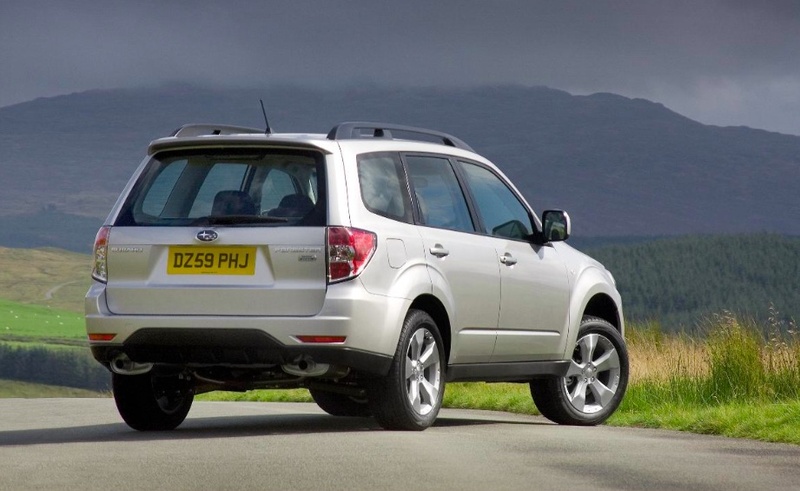 There are times when I wish the Forester had a bit more style but I’d really rather go for substance when buying a four-wheel drive – especially one that is obviously built to withstand whatever you can throw at it. The 2013 version is a little noisy when pushed hard under acceleration but we’re still managing 42mpg in everyday use. This is helped by the six-speed gearbox, which is surprisingly slick for a chunky estate. OK, so it doesn’t go around a corner with the poise of a Honda CR-V but the chances are you will be carrying a large dog, or a couple of sheep in the back anyway. And it’s all backed up by a five-year, 100,000-mile warranty too. What more could you want? I’m not sure the great British car-buying public really understand Subaru. Seriously, the company has carved out such a niche for itself that there are still a long of people out there who are still uncertain about the brand. In a search for a family-friendly SUV, they either pay a premium for an image-conscious BMW or Audi all-wheel drive, or they go for a cheaper, pseudo 4×4 from Nissan or Renault that looks the part but will be left in the dirt when set against a Subaru. 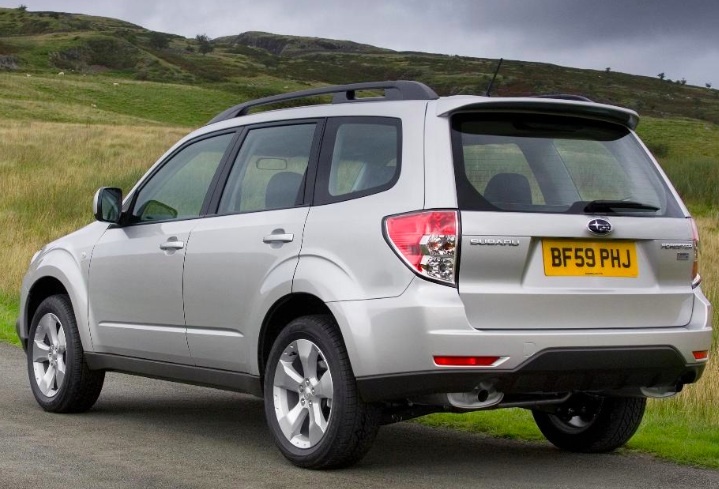 Hopefully over the next seven days we can try and persuade you that despite the Ugly Betty looks, the Forester should definitely be on your list of options. It may not be as pretty as an X3 or a Q5 but it will prove ultra reliable, practical, brilliant off-road and kind of cool, in a slightly alternative type of way. I’ve just driven our XC back from Heathrow. It has excellent road manners, takes a corner well and is surprisingly good fun on a twisty A-road. It may look a Plain Jane but the Forester is worthy of being regarded as much more than just a farmer’s car for carrying damp Border Collies. You know that feeling on a dual carriageway when you move out to overtake and realise the power just isn’t there? That happened today when the 92bhp 2008 just didn’t have the legs to get past a lowly old Volvo. I can’t say our 1.6 diesel feels sluggish around town but at motorways speeds, you really need the 115bhp model – or the 1.6 VTi petrol that produces 120bhp. The 2008 isn’t a car that I’ve really warmed to yet. 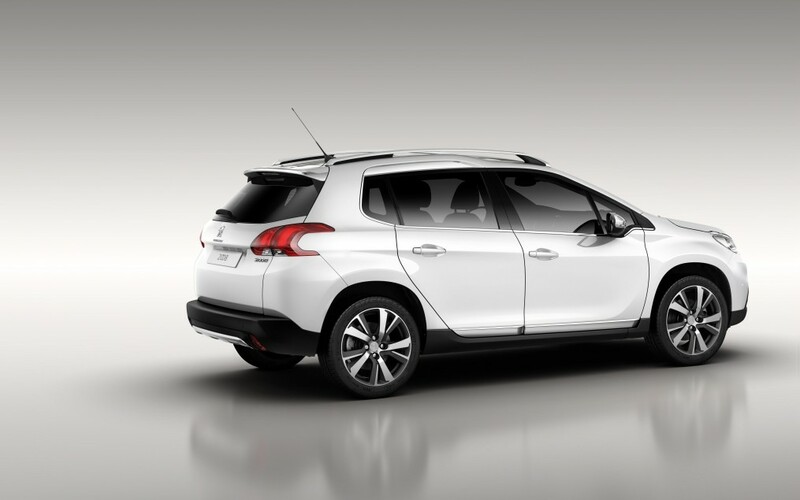 It feels more like a small minibus than an innovative, mini estate that will fulfil the motoring requirements of Peugeot’s global family. It just doesn’t have enough going for it to put it above the crowd of urban crossovers out there, like the funky Renault Captur and the bug-eyed Nissan Juke. A car like this needs more than a crazy interior headlining and a rather annoying aircraft-style handbrake lever. I don’t think I’ve ever driven a car as small as the Fiat 500. That’s small on the outside because inside, it seems to stretch to accomodate all you can throw at it. The back seats would certainly take two toddlers, or a couple of young teenagers. Jessica and I managed to pack weekend bags, coats and assorted wet eather gear into the boot easily. Our backseat was a more than comfortable platform for a large, brown Vizsla who accompanied us to the Pembroke Arms in Wilton, near Salisbury. Fitting Malin into an assortment of cars can be a test of nerve and ingenuity. I feared the worst with the 500 but he seems happier in it than most cars. It’s either because he can sit upright with plenty of headroom, or because he read the blurb for the Pembroke Arms, which provided him with a dog bed, his own canine menu (steak, saugages – can you believe it!) and some biscuit treats as part of the deal. 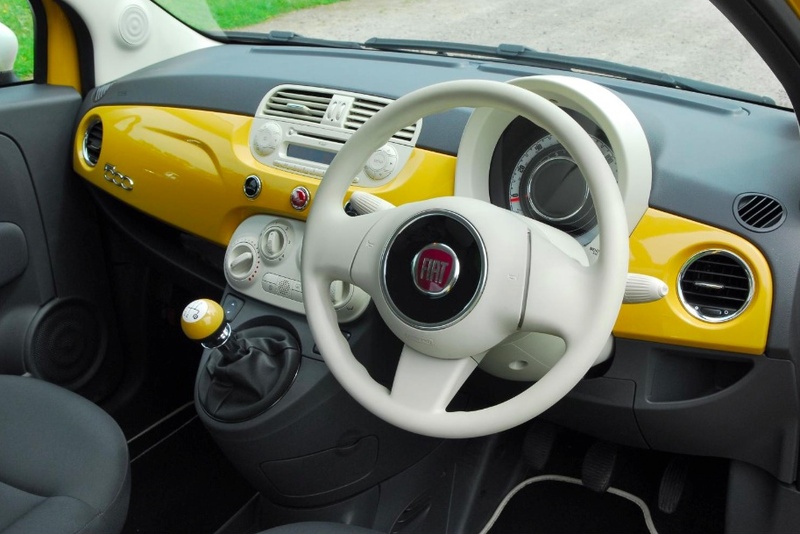 You have to accept a few idiosyncracies with the Fiat interior. It’s tricky to find the slot for the safety belt, the white steering wheel and headrests are going to get grubby pretty quickly and the 500 really should have steering columns controls for the music system. But I still sit very comfortably on the wide fabric seats and there’s a tremendous ambience about the cabin. 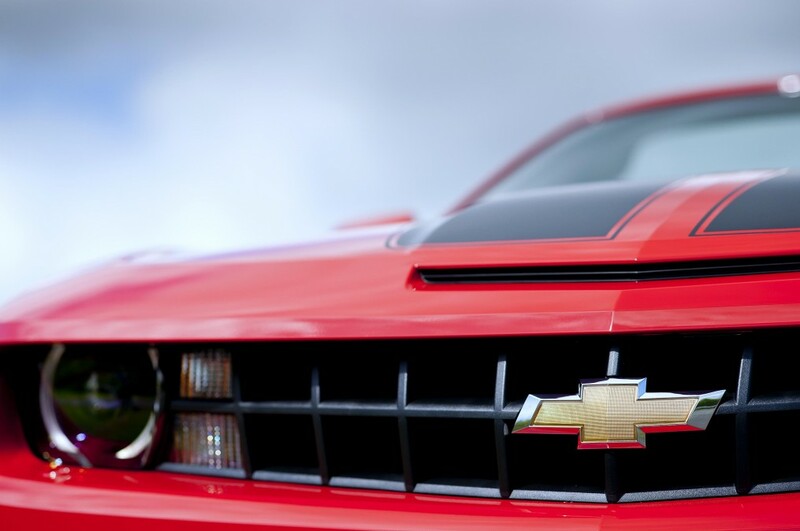 If colour, form and function affect your driving mood, you really need to try a Colour Therapy.